Instagram sensation Isabelle Kessedjian has created this adorable doll and amazing wardrobe in crochet! Designs include a wide range of outfits, from school days and bedtime to cute fancy dress costumes and adventures to the North Pole! 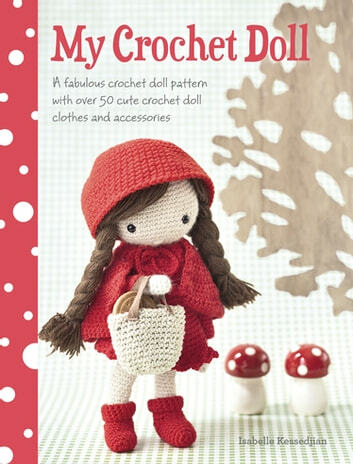 Discover how to crochet your doll and then personalize her with your choice of hair, clothing and accessories. She even has a cute suitcase to store all of her belongings, which can also double up as a bed! Be aware that crochet terms in the US are different from those in the UK. This can be confusing as the same terms are used to refer to different stitches under each system. All crochet patterns in this book are written in UK and European terms. US crocheters must take care that they work the correct stitches. One way to tell which system is being used in other patterns is that the American system starts with a single crochet, which the UK system doesn't have; so patterns with 'sc' in them can be identified as American patterns.